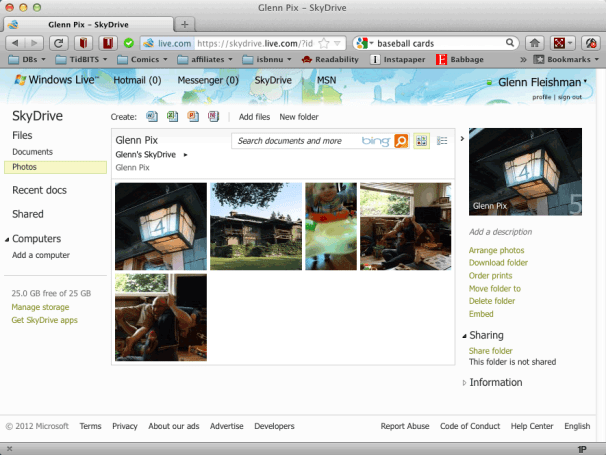 On the basics, SkyDrive compares to Dropbox () and Google Drive. The service provides desktop sync software for Windows and Mac OS X (10.7 Lion only), as well as mobile access software for Windows Phone and iOS. A Web app also provides access to your storage, too, with drag-and-drop uploads in the browser. Uploads and syncs on the desktop happen speedily and without any tedious management. Not many options: SkyDrive’s Mac preferences are remarkably limited. However, SkyDrive offers zero Finder integration beyond a system menu item, and that’s a problem for Mac users, especially compared to Dropbox and Google Drive. While neither service has a full-fledged native software client, such as that offered by SugarSync on multiple platforms, both provide cues. Google and Dropbox show the status of sync on an individual file and folder basis by updating an icon to show a green checkmark or other symbols. Dropbox uses a contextual menu to pick from activities related to a file or folder, all of which are performed in a Web browser, but which at least take you to the right place. Google omits that. Microsoft omits both. You don’t realize how much you rely on the icon cues and contextual menu option until they’re gone. I found myself repeatedly dropping down the SkyDrive system menu, which shows the current sync status, to see if uploads or downloads were complete. The minimal preferences don’t let you choose to sync only selected folders, either, a feature in both main competitors. Nor does it have Dropbox’s option (missing in Google Drive) to pause synchronization or throttle bandwidth usage. For laptop toters, bandwidth can be at a premium on hotspot networks, or, when linked via a cell modem, expensive. The Web app is very Windows-y, but it has a number of subtle touches and useful features that stand out in their own right and also outpace competing services. If you spend a lot of time using the Web app, you will find it more useful than Dropbox or Google Drive’s for previewing files, at the very least. Useful Web app: The SkyDrive Web app provides rich details about files. SkyDrive’s sharing parameters are abundant. You may share a link via email, Facebook, or Twitter, the latter two requiring you to link in your accounts. You can also generate a link. Links can be set to be read-only or to allow editing. Email links can be restricted to those who log in to a Live.com account. Finally, a file can be made publicly searchable. Shared files and folders show what’s been linked via a right-hand sidebar, from which you can change permissions. Microsoft makes shared files available in the SkyDrive Web app via a Shared link in the left-hand sidebar, but otherwise, shared items can be edited or viewed only via the Web, although they may be downloaded. Also, in testing, I was unable to get a shared file or folder to appear in another account’s Shared list, even though the link worked and was available for editing for that account when used directly. 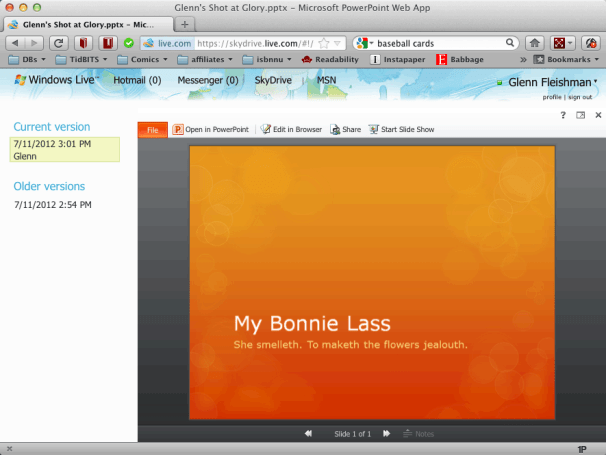 File editing: Office documents, like PowerPoint, can be directly edited in a Web app from the SkyDrive site. iOS app: The SkyDrive app brings simplicity to navigating storage, and offers previews of images and natively supported file types, as well as generating shared links to stored items. The Web app previews documents rather nicely, and has a good leg up on other services. Images in any folder may be selected, and a small preview appears in the right-hand sidebar. Double-click and the image fills the browser, and provides navigation for looking at other images in the same folder. This works for sharing, too, where sending a link to a folder full of pictures lets the recipient view it as a gallery. The SkyDrive app has a neat simplicity. It provides a straight forward view of items, along with the ability to preview those types supported in iOS, which includes Word and Excel, or downloaded and then opened in another app. Images can be viewed as gallery thumbnails or downloaded to local pictures storage. The app can generate and send links to items and folders, as well as upload photos and videos. Microsoft includes a hearty 7GB of storage for free accounts, although previous users of SkyDrive had the option for a free bump to 25GB. The fees for more storage are relatively inexpensive. Add 20GB on top of existing a 7GB or 25GB free allocation for $10 a year, add 50GB for $25 per year, and add 100GB for $50 per year. That’s half of Dropbox’s rate (revised in July), which are 100GB for $99 per year (or $10 per month) and 200GB for $199 per year (or $20 per month). Google’s combined Drive, Gmail, and Picasa storage is slightly more expensive than Microsoft’s. 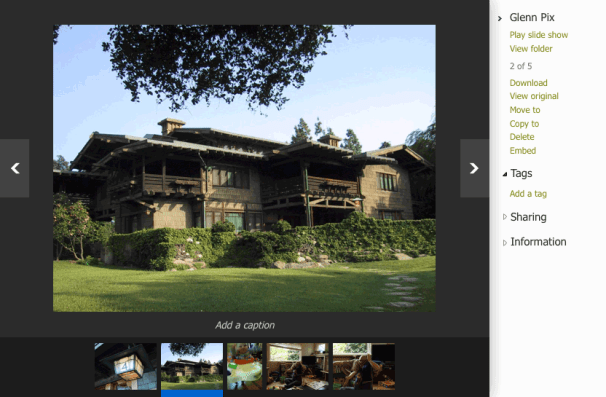 Gallery view: SkyDrive has terrific options for viewing photos and galleries in browsers. An argument for using Microsoft more mediocre products was once that it made sense if you worked mostly or largely with people running Windows. That argument isn’t viable any more, as SkyDrive’s competitors perform as well under Windows as they do under Mac OS X, and SkyDrive both works well taken by itself and compares well to others. Still, it’s hard to find a single compelling reason to pick it outside of its superb use of the Web.